We will be conducting some micro-surveys to see what is important to the Transplant community. One question at a time, simply click the response to participate! What DO THINK is the most important thing for TTS to focus on? 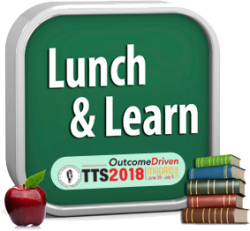 Lunch and Learn Sessions will feature small groups with a maximum of nine delegates matched with a facilitator of their choice. Sixty groups over a three-day are planned. Submitted by Dr Peri Kocabayoglu Editorial Fellow, Transplantation. Pearson ACS, Subramanian A, Schroeder DR, Findlay JY. The surgical Apgar score (SAS) entails parameters including the lowest heart rate, lowest mean arterial pressure, and estimated blood loss (EBL). In this retrospective analysis of 628 liver transplantations, the authors developed a modified SAS that can be utilized to predict early morbidity and mortality. This modified version of the SAS, termed SAS-LT, is calculated by replacing the EBL parameter with volume of red blood cells transfused. One hundred five out of 628 liver transplant recipients (16.7%) included in this study demonstrated serious perioperative morbidities or mortalities. The SAS-LT score had a similar predictive ability compared to models for end-stage liver disease, Acute Physiology and Chronic Health Evaluation III, and Sequential Organ Failure Assessment scores. In fact, the SAS-LT proved to be a straightforward intraoperative score predicting death or severe complications within the early postoperative period. Further studies into other intraoperatively measured parameters and variables will be necessary to optimize the approach while the total volume of RBCs transfused during transplantation should be studied as an independent predictor of outcomes. April 17 - In a paper published in Nature, Nasralla et al. report the results of a clinical trial that compared two organ storage methods. April 17 - A man in Paris has become the world's first to successfully receive two facial transplants. Jérôme Hamon, 43, underwent his first face transplantation procedure in 2010 to treat neurofibromatosis, a genetic disorder characterized by the growth of tumors along nerves in the skin, brain and other parts of the body. Yet Hamon's body rejected the original transplant. April 15 - ARIS -- Since use of direct acting antiviral combination therapies for hepatitis C virus (HCV) infection became widespread, the need for liver transplantation for patients with the infection has plummeted, researchers reported here. April 5 - The risk of death from infection after kidney transplantation dropped by half since the 1990s in Finland, researchers reported. April 12 - The findings, which appear in an upcoming issue of the Clinical Journal of the American Society of Nephrology (CJASN), point to the need for education and training for clinicians to improve equity in access to transplantation. April 11 - The FDA has programs designed to expedite the drug development and review processes for promising pipeline products. These programs include Accelerated Approval, Breakthrough, Fast Track, and Priority Review designations. The newest of these programs is Regenerative Medicine Advanced Therapy (RMAT).d. April 6 - The use of direct-acting antivirals (DAA) is associated with significant improvements in survival in patients undergoing liver transplantation because of hepatitis C virus (HCV)-related liver disease and decreased the number of patients with HCV needing liver transplantation, according to a study published in the Journal of Hepatology. April 11 - Today at the 38th Annual International Society for Heart and Lung Transplantation (ISHLT) Meeting & Scientific Sessions, researchers shared results during Wednesday’s Cutting Edge CTEPH: From Metabolomics to Surgical Technique presentations. April 6 - Belarus ranks 24th among the world's most developed countries in terms of transplantation, BelTA learned from Belarusian Healthcare Minister Valery Malashko at the international science and practice conference “Ten years of liver transplantation in the Republic of Belarus: ethical challenges, results and perspectives” in Minsk on 6 April. April 13 - The number of Manitobans registering to be organ donors has skyrocketed in the week since the deadly Humboldt Broncos bus crash. April 11 - The first study to track outcomes of transplanted kidneys that were previously deemed unfit for transplant shows a more than 90 percent graft survival rate for these kidneys a year after patients received them. April 17 - A pilot program conducted by Keck Medicine of USC has succeeded in alleviating problems faced by patients on post-lung transplant regimens. A failure by the patients to monitor their health and stick to medication schedules can lead to serious complications — from infection to rejection of a transplanted lung. April 14 - In the coming five years, the kidney of pigs can be used to treat the renal failure patients. If the government will relax some of its guidelines, then a person sitting in the US can donate his kidney to a matching donor in India or vice-versa through global paired donation.